Dance is movement. Photography is a standstill. Dance is performance. Photography is a snapshot. Dance only exists in the performance. Photography also in the reproduction. 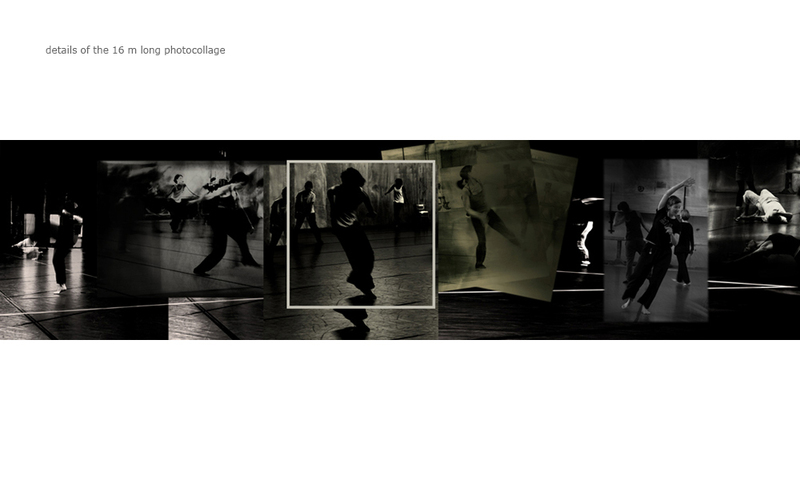 Despite their contrasts the relationship between dance and photography is a close one. The eternal longing for the illustration of movement exists since the beginning of photography. Dance, although it has been tried to be transformed into a medium/data in a comprehensive way, will only be able to show traces of movement. While documentarists of early times of contemporary dance have portrayed famous dancers in the studio, in Dadaism and Bauhaus are as dance became an integral part of the modernity of photography. The history of photography tried to make dance tangible by using strict poses and razor-sharp pictures as well as experiments of movement, light and colour. Especially because of its ambivalence the dancing photo images open up new perspectives and make it possible to experience dance in a new way. The two artists represented in this exhibition, Karolina Miernik and Magdalena Zeisel, found a medium in photography to visualize their fascinations with dance. The exhibited photographs arose from the past three years of ImPulsTanz workshops. The premises of Arsenal, where stage designers, carpenters and locksmiths are active for the state opera and Burgtheater for the remainder of the year, are being defined by movements and sounds during the ImPulsTanz festival. 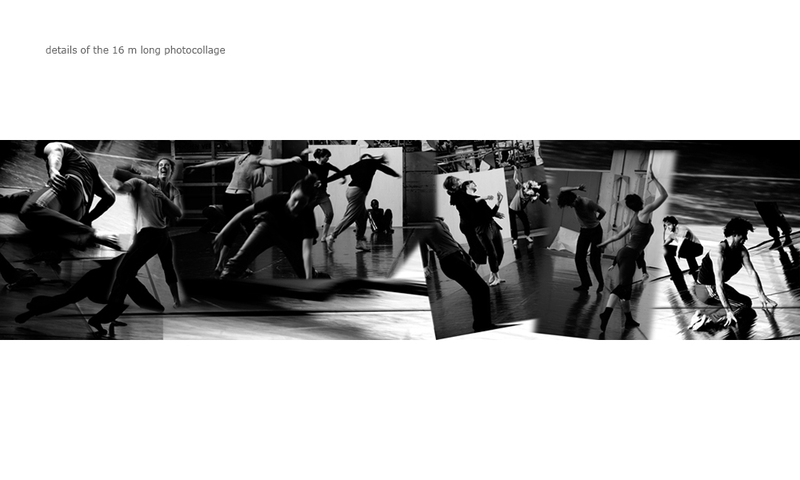 The artists' works are being characterized by two opposing approaches, which however in their photographic results indicate a similar view of dance and photography. Karolina Miernik's pictures are snapshots of dance movements - the body becomes visible through movement. Movement is being symbolically transposed through gestures, facial expressions and pastures as well as serial work. Magdalena Zeisel on the other hand makes movement visible through the body by working with long time exposure among other things. 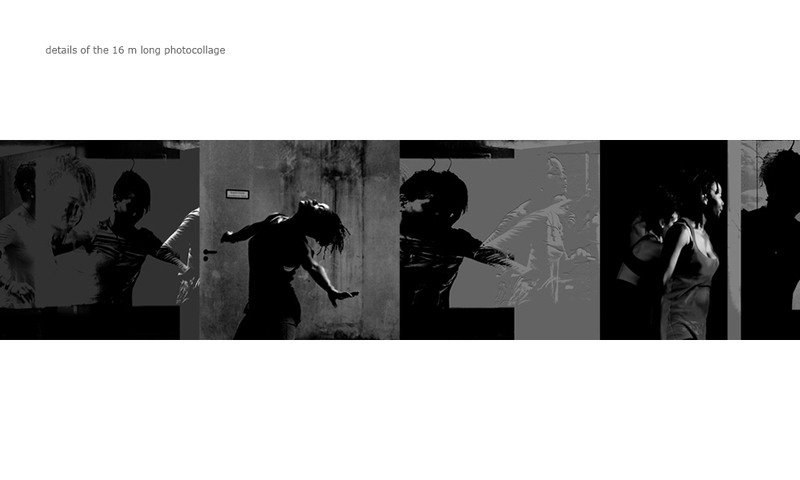 She fragments, isolates and uses collage effects in her pictures and addresses dance and movements as a continuum. With her background being in visual arts her approach to photography is very picturesque. She applies light like a brush - this results in drawing lines and picturesque speckles. It is not rare for the artist to work with layering, for example by placing coal or chalk drawings over photographs. The dynamic of movements is thereby emphasized more intensely. In dance in general as well as in the artists' work and exhibition, space plays a central role. Space means on the one hand the "danced out room", which is taken in by the movements of the dancers, and on the other hand the concrete space which functions as a dance studio, workshop and showroom. Dance happens in space and is subject to its laws. Therefore Karolina Miernik's and Magdalena Zeisel's photographs are always rendered in their spacial effect. Spacial elements, shadows and light create structures and place the movements in patterns. Karolina Miernik's photographic gaze is directed to a lesser degree on individual dancers but more on the dancers as an entity in the room. How is the group operating in the space? In which way does the space influence the movement? To what extend is the choreography defined by the space? Those are central questions which are being raised by Karolina Miernik's photographs as well as the daily work of dancers and choreographers. 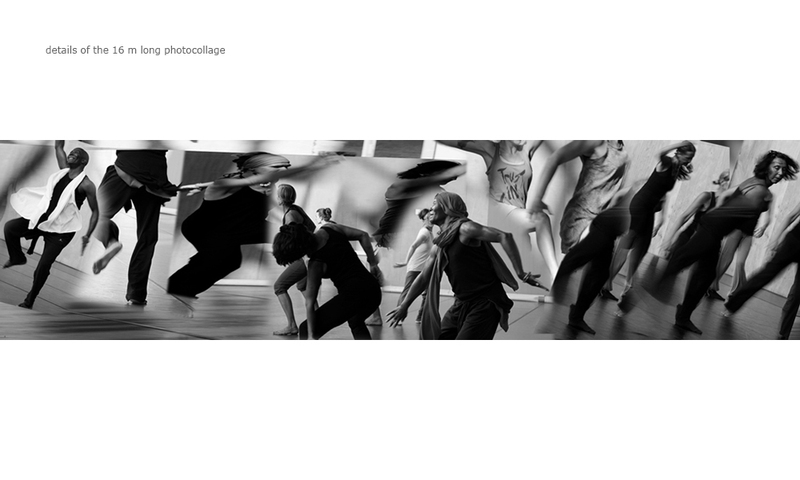 The photographer presents both, groups of dancers and just fragments of their bodies. A dancer's foot can convey just as much movement as a whole dance company. In Magdalena Zeisel's work even empty rooms by themselves seem to impart the dynamic of a whole choreography. She chooses a (photographic) moment before or shortly after the dancers take up the room. Precisely through the not portraying of movement, suspense is noticeable. 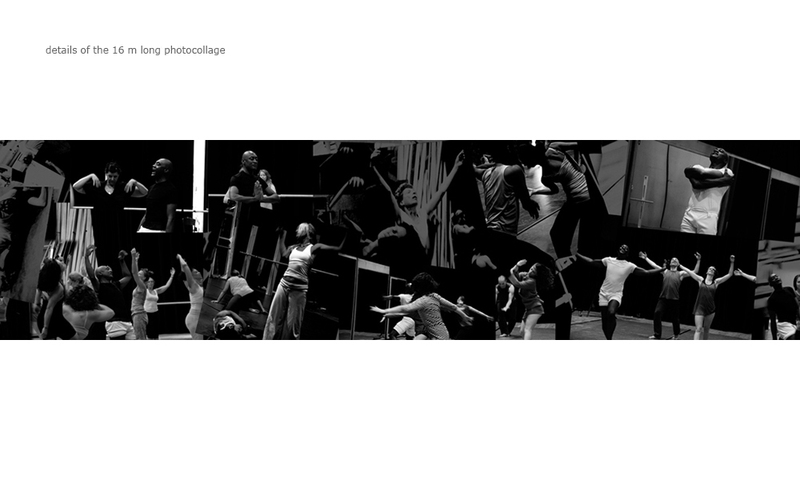 The "danced out" space reaches its height/climax in the sixteen meter long collage by Magdalena Zeisel. 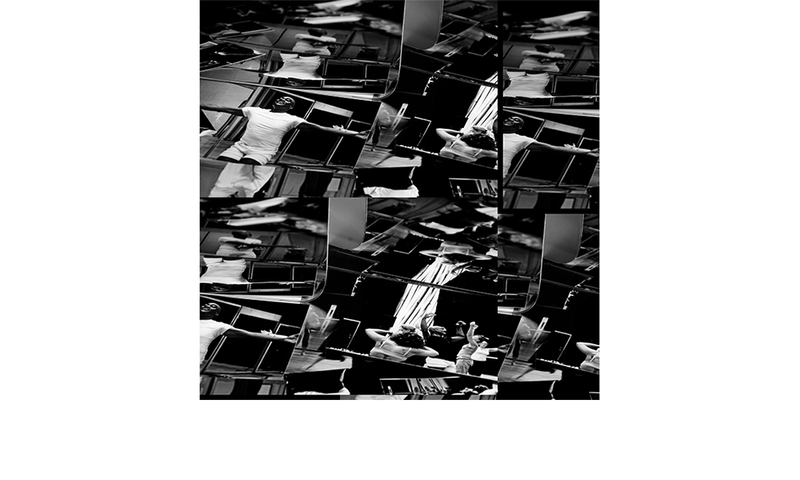 Through fragmentation and collaging a new photographic space is being generated. Simultaneously the space is being experienced in a physical way while the spectator is walking along the path to look at the collage. Just as the dancers in Magdalena Zeisel's collage are occupying the room, so the spectator is taking in the space through his movement, step by step. The pictures of Karolina Miernik and Magdalena Zeisel don't attempt to capture choreographic sequences or make movement straceable, but instead they are trying to reinvent movement. The movements per se are the focus, together with the dancing collection and the use of space. This introduces a new aesthetic quality. Dance is being experienced on another level and by doing so is in constant exchange with the photographic and physical space as well as the people in it.